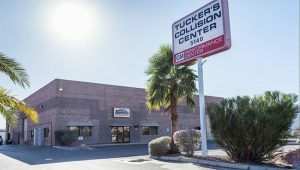 We would like to take this opportunity to let Winchester residents know that they can bring their car, truck, van, crossover, or SUV to Tucker’s Collision Center in Las Vegas for any level of body/paint service. We operate a GM certified collision center with years of expertise, specialized equipment training, and access to the industry’s most innovative collision service protocols. Rest assured that the best way to return your vehicle to its factory setting is to receive paint and bodywork at Tucker’s Collision Center in Las Vegas. Residents of Winchester, Nevada sometimes don’t realize how close they are to the best collision center in the Las Vegas area. Tucker’s Collision Center is conveniently located southwest of Winchester within a 20-minute drive. Tucker’s Collision Center in Las Vegas is conveniently located just off NV-593. Winchester residents can simply drive south on S Eastern Avenue to NV-593 West directly to our Las Vegas collision service center. Now you don’t have to risk cutting corners with a collision repair shop located in a side street garage because a high-quality collision center is readily available. Instead, you have the option to get the highest quality collision repair service by a GM certified collision repair center. We guarantee all of our paint and bodywork for the life of your vehicle. At Tucker’s Collision Center, all services are completed conveniently and at a premier quality. If you live in Winchester and have a vehicle in need of collision repair service, it is now the best time to call a premier collision service provider to make sure the job gets done right. If you just realized that you should have been coming to Tucker’s Collision Center in Las Vegas all along, we welcome you to schedule an appointment today. You don’t have to continue driving a damaged vehicle when affordable and high-quality collision repair services are already available. Schedule an appointment today at Tucker’s Collision Center in Las Vegas to have your vehicle repaired at a premier paint and body facility with GM certified experts. Tucker’s Collision Center is conveniently located within a 20-minute drive for Winchester, NV residents.